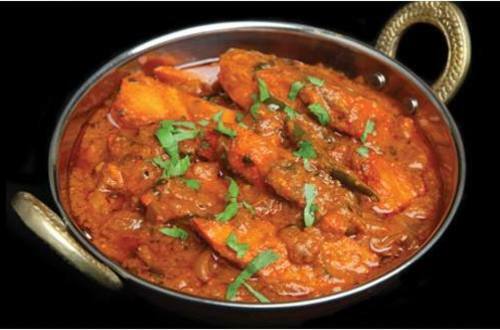 Kadai Chicken is a spicy chicken dish that comes alive with the rich aroma of ginger and tomatoes. It makes an excellent side dish for Biryani and is a great alternative to mutton. It is usually served in a brass dish called ‘Kadai’ in Indian restaurants. 1 In a deep pan, heat 3 tbsp vegetable oil, Add cumin seeds and allow it to splutter,Add whole red chilies. 2 Add 2 chopped onion and fry until golden brown. 3 Add 2 Chopped tomatoes, 1/2 tbsp ginger-garlic paste, coriander powder, red chili powder, turmeric powder and salt to taste. 4 Add pre-cut chicken along with capsicum, tomatoes, onion (1 inch cubes) into the onion tomato masala, add cashew nut paste and cook for 15 minutes. 5 Add 2 tbsp of Knorr Chef’s Chicken Masala and add 1 cup (150 ml) of water. Cook until tender. 6 Garnish with chopped coriander leaves. 7 Serve hot and enjoy!